Pvs-14 build.... use for astronomy? I used to be a frequent here but long ago sold off all my equipment due to light pollution and barely ever having time to pull the big dob or 12" sct out that I once owned. Anyway... I recently bought a cheap gen1 rifle mount NV scope. It worked decent with IR light assistence but quickly started looking into gen3, and how I could get into one on a budget. Im in the process of building a gen 3 pvs-14 monocular and just ordered a milspec housing kit. I will be looking to buy my intensifier tube within the next few weeks and once assembled will purge the unit with welding argon gas. Ive spent many weeks reading about various tube specs and although id like to stick with a later contract mx11769/uv tube.... ill probably have to settle for an mx10160 tube but think I will be ok as long as I get one omni contract iv or later. Im building this pvs-14 pretty much just to have and because the technology fascinates me. I plan on using it when camping to do some night hikes, but ive missed astronomy and stumbled across several cloudynights posts about people using these devices for viewing the faint fuzzies. Will I be able to use my pvs-14 to any degree of success viewing the skies or do i need an adapter and a scope? I do have an orion st100 I still have. Actually ive never even used it before,its still in its box. You will guickly hear this and I wish you had checked before you bought. If you can return the PVS-14, you may want to do that. The preferred device for astronomy use is the AB Nighvision Mod 3 body with C mount. This body follows the same general format as the PVS-14 and uses the same eyepiece. I can be mounted in any way that a PVS-14 can be mounted. The lens we are using is the ENVIS. Optically, this is the same lens as the PVS-14 lens. This means that optically and operationally , the Mod 3 is pretty much the same thing as the PVS-14. The difference is that the ENVIS objective unscrews and when it does, you can screw on a $20 1.25" to C mount barrel, and this lets you stick it in the focuser just like any other eyepiece. Now, that does not mean that you can't use your PVS-14, but the Mod 3 is far more flexible. The PVS-14 could be used at 1x and 3x easily, but you can't use SLR lenses, and the only way to use it for a telescope is afocal (using adapters to attach it to the eyepiece, but this would make it very clumsy to use). My advice thoughis that if astronomy is going to be in important application, return the PVS-14 unopened and get in touch with an AB Night Vision dealer and get a Mod 3 monocular, or ask your current dealer to let you exchange it to Mod 3 body. And a note.. The price of the Mod 3 is often given for the binocular. The Mod 3 binocular is two monoculars on a component bridge but the monoculars can be bought separately in left or right hand versions for well under half the cost of the complete binocular. Edited by Eddgie, 30 May 2017 - 11:04 AM. The mod 3 housing kit is actually cheaper than the the pvs-14 housing kit I ordered. Let me take a stab at seeing if I understand this. So the mod3 is a modular housing tube system. The housing can be used as a monocular with the monocular battery housing or you can attatch 2 of the units to a bino bracket? I dont see where the difference is? Is it in the c mount option? What does this do... give me the option to screw on filters and/or a tube to be used in a telescope focuser? I see the option to add c mount lenses for $50.... is this just the objective lens, the eyepiece lens, or both? Looks like i could save a few bucks switching my order to one of these but i dont want to make an uninformed rush decision as I know nothing about these mod3 units. Im in the process of modifying a helmet and ordered a NV mounting system for the helmet, shroud, and pvs-14 j arm. I dont know if the mod3 would work with this setup. Also ..... what tubes does the mod3 accept? Maybe when my pvs-14 build is done ill start researching on building a mod3 next. The Mod 3 uses the same tubes as the PVS-14. The Mod 3 can be attached with the appropriate bracket to a helmet. It has the same mounting point design as the PVS-14. 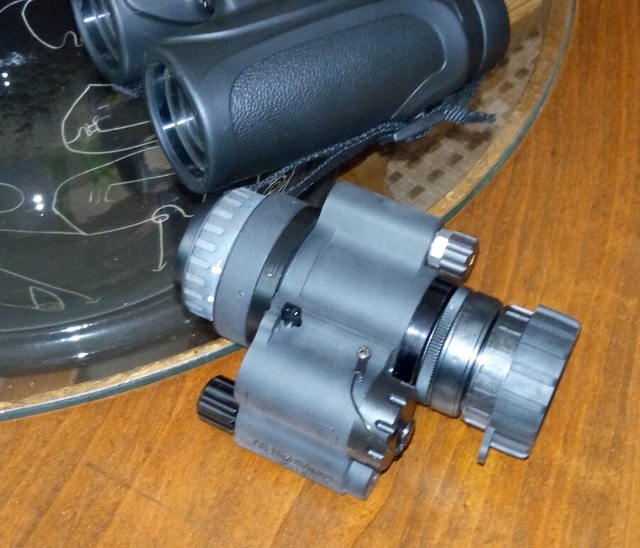 The binocular is available with either ANVIS or PVS-14 objectives but these are semi-fixed. The C mount usually comes with the ENVIS which is pretty much the same lens as the PVS-14 objective, but it is designed to be screwed on and off, and this can't be done with the ANVIS or PVS-14 objectives. All of them use the exact same eyepiece, which is the same as the PVS-14 eyepiece. So, operationally and optically, it is the same as the PVS-14, but you can remove the objective and using a 1.25" to C mount nose, you can screw that on and use it at prime focus in a telescope just like any other eyepiece. 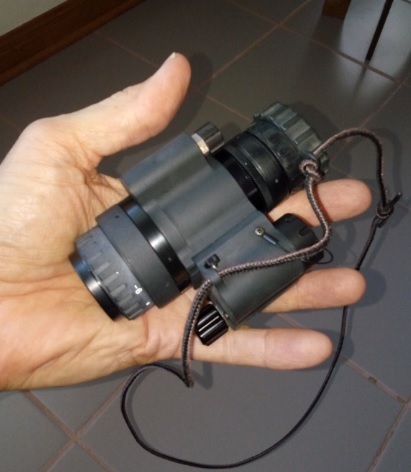 As I mentioned, the monocular is used on a binocular as well, so the right and left monocular housings and power supplies are different. They are mirror image for the gain control so that when the power supplies are removed and the body is attached to the bridge, the right unit gain control is on the lower right side at the front of the binocular, and the left unit gain control is on the lower front left if the binocular. This is a small point, but if you have a preference for which side you would like your gain control on, when you order, you can ask for a right or left module. Anyway, it is pretty much a PVS-14 with a removable power supply and a removable objective. Not that you would ever need to remove the power supply when used as monocular, but that is how it differs form the PVS-14. Otherwise, it is about the same size and weight as the PVS-14 and will do pretty much anything the PVS-14 does to the same level of performance as the PVS-14 because the optical elements are the same (though of course the optics of the objective are packaged differently so that it can be removed). Edited by Eddgie, 30 May 2017 - 11:55 AM. I dont know how - In my weeks of research/posting questions, noone mentioned this device as an option. Someone mentioned the MUM which is a smaller PVS-14 style monocular but noone mentioned the Mod3. So If I ordered that kit, with the c-mount style lenses ($50) I would be at $570 vs the $675 I paid for the pvs-14 kit. But with the mod3 kit above....Is that it? Is it a complete kit minus the image tube of course? I ordered the Norotos Rhino II Titanium mount and a PVS-14 J-arm....Not sure if those would work for helmet mounting or not but I have read of the PVS-14 being converted for dovetail mounting so sure there is an option out there to do it. EDIT.... "while the monocular adapters simply require the addition of any PVS-14 J-Arm to attach to a helmet mount." "To answer your astronomy question, we have team up with Al Nagler and TeleVue and are about to release a PVS14-14 adapter to fit on the back of different eye piece adapters. TeleVue and TNVC have been dispelling the rumor mill that AFCOCAL is somehow bad vs. prime focus. It's not and I encourage you to read this article as from TeleVue. Bottom line, if you already have a PVS-14 (sure we'd love to sell you a MOD) save your pennies for some TeleVue eyepieces, you will love us more in the end!" I did send them a message asking about the MOD3 and if my order could be changed. With the afocal method... I could have my pvs-14 ready to go to helmet mount or to observe in a scope....but I wonder how much the adapter costs and if it only works with televue eyepieces? With the mod3 I would only need the 1.25" to c-mount thread objective tube adapter right? But would have to remove/re-install the front objective lens to go from astronomy to head mounted use, is this right? I guess...if its too late to change my order....at least I will have an option down the road when they release the afocal adapter. Edited by deezdrama, 30 May 2017 - 01:04 PM. Change your order. If you can't change it, I'm sure you can resell the PVS14 for only a small loss. TNVC has Their own opinion, but most here will tell you that the Mod 3 C is the way to go if it is going to be used at all for astronomy. Also, because the ENVIS has the same threads on the front as the PVS-14, anything that Televue makes for the PVS-14 should work fine with the Mod 3 C.
From what I can tell above, what the package in the link is showing is only the body and power supply. 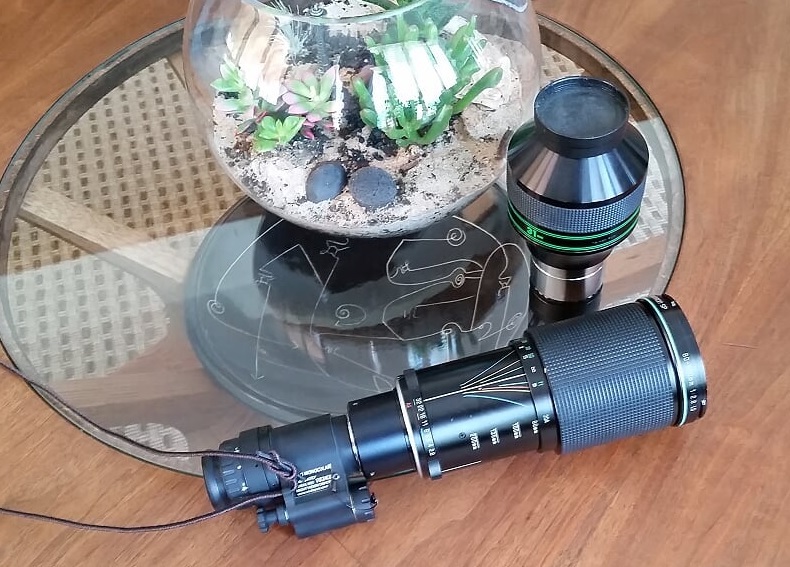 In addition to the housing kit, you would need a PVS-14 eyepiece kit, and an ENVIS lens. A lot of us have bought from Richard at Ultimate Night Vision, so if you have any questions, just call them, and last time I talked to Richard, he still had ENVIS lenses in stock. Most people don't even know the Mod 3 C exists. Richard knows because I kind of hounded Adam Baker at AB NightVision to get this version of the Mod 3 into production, and Richard was the dealer I worked with to do the build, so Richard has probably sold pretty much all of the Mod 3 Cs ever sold. Again, very few people outside of Richard at Ultimate probably even knows that the C mount version of the Mod 3 even exists. It has only been out for a year, and most non-astronomers would not think about the utility of being able to remove the objective lens, so most don't even care that it exists (and most dealers don't care either). And once again, the PVS-14 only works afocally, but the Mod 3 lets you use all kind of interesting stuff!!! 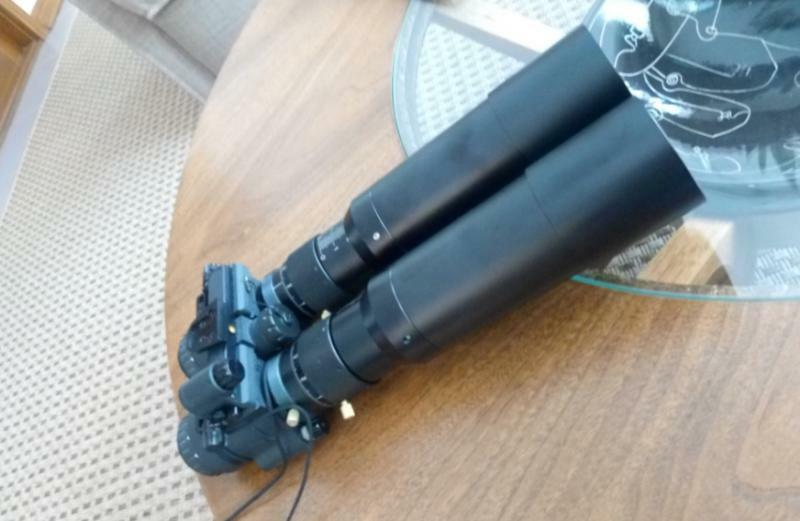 Here is a picture of my Mod 3 binocular using a pair of CCD Guider Scopes as objectives. Several people have done this using finders or CCD guide scopes. You can also use SLR lenses. Here is a Micro body (similar to the Mod 3, but no gain control) using an SLR zoom lens. You can't do any of this with a PVS-14 but with any C mount device (Micro, Mod 3C, and PVS-7s converted to C mount which is easy to do) you have a huge amount of flexibiity, and the Mod 3 C does pretty much everything the PVS-14 does and exactly as well because all of the optics are the same. You give up nothing to go to Mod 3 C, and you gain a huge amount of flexibility. Edited by Eddgie, 30 May 2017 - 01:33 PM. Im sold on it as long as its within my budget. Im just confused over the kit UNV is selling. In the dropdown menu you can select pvs-14 style lenses or c-mount style lenses for $50 more. I wish it would denote whether or not the lenses are actually included. I sent them an email asking about it, hopefully will hear back soon. I was just going by what they show in the picture and what they show is a housing and I think that you are mis-reading the drop down. What this I think is saying is that you pay $50 more for the C mount version than you pay for the PVS-14 version. With either version, you would still have to add your own lenses. At least this is the way I see it. If you price PVS-14 objectives lenses by themselves, you will see that they run about $279. If you price PVS-14 eyepieces, you will see that they sell for about $279. So, we are looking at $560 just for optical components, which would mean they would be giving away the body. So, I think you are reading it wrong, but I could be wrong. It happens with great regularity. And while the above is bad news (more than you thought) the good news is that while the Mod 3 C mount housing costs $50 more than the Mod 3 for PVS-14 objective, the ENVIS lens for the Mod 3 C is less than half the price of the PVS-14 objective lens. I think you can buy them for about $110 or $120 or so. The eyepiece is the same though, so no cost savings there. Of course with some shopping you can also find PVS-14 eyepieces cheap and again, this is the same eyepiece used on the Mod 3 monoculars. ... so thats what made me wonder but you probably are right. I could probably find a pvs-14 lens on another forums classifieds for a decent price. Then I would just need the ENVIS lens (what were these originally made for)? And so the ENVIS lens would be the only one that works with the c-mount? What makes it a c-mount, Its just internally threaded for camera optics/lenses? But in our case we would be screwing on a 1.25" tube for telescope focuser fittment? What types of filters would I be looking at needing? I never used filters much back in my observing days, and do those then just screw into the 1.25" adapter tube? To be sure, afocal is not "bad". You can use the Mod3 afocally too. What afocal is is cumbersome. Much better to have that front C-mount lens, as Eddgie has pointed out this makes the device more versatile. Your budget is your budget and I can't help with that. As for your questions though, first the ENVIS . The ENVIS is a military acronym "Evader's Night Vision Imaging System" (though I have seen other definitions) and the device that most often comes to mind is the M703E. These were issued to air crews for night ops and where intended to provide the above mentioned capability to the air crew in the event that they were downed. These looked a lot like a simplified PVS-14 housing and as I recall, they did not have gain control and I don't even think they had IR illuinator. The idea was to provide a very light weight, simple, and rugged device to help them find safety. Now the ENVIS did not use the PVS-7 lens (and the ENVIS was in service I think before the PVS-14) but it used the same optics as the objective in the PVS-7 (which is again the same as the PVS-14 more or less) but instead was equipped with the removable lens that we now refer to genercially as the ENVIS lens. The lens is threaded with the Cine mount (C mount) standard thread that was used in 16mm move cameras. Why? Heck, ask someone that knows. The benefit of the C mount though is as you can see above, it allows a huge range of SLR lenses to be used, and it it allows easy screw on conversion to scope use. There is no easy answer on filters, but these are the most common. 3nm I guess for seeing nebula in the presence of searchlights?? Simple red "Planetary" filters or Baader 610nm for less light polluted skies (though I have excellent results wtih these from the city for stelllar targets and galaxies). 650nm IR pass. I use this a lot from the city. 685nm IR pass. Particularly useful for achromats to suppress the bloom from stars due to the unfocused light. I find them not necessary for Apos or reflectors, but essential for achromats, but I feel that for general work, the 650nm handles even the worst light pollution well enough, and I see some limiting magnitude loss with these more agressive fitlers, but clearly your mileage on this filter may vary a great deal. For cities though, one of these two is almost always used by most people. Now as I mentioned, you can use a 2" nose with C mount threads, but this means 2" filters (though there is an adapter that has both 2" and 1.25" threads but I don't know the advantage to this over just using a 1.25" barrel with a 1.25" filter and a 2" to 1.25" adapter that most people already have. Since 2" H-a filters can get very expensive very fast, most people seem to go 1.25", but you have the option of doing it either way. This is the 1.25" to C mount I use. This one does not have a flange at the top, so it saves a couple of millimeters of in travel. Most scopes will be able to reach focus with the one with the flange, but I am running a setup were spacing from the corrector is critical and this one works better for me and the price is right. For those that can't wait there is this one at Agena so very quick to arrive. And here is the one with the flange. I prefer flangeless, but this was intended to show you the choices. Edited by Eddgie, 30 May 2017 - 03:25 PM. Yes, afocal is not at all bad and may have some value, but most people use Barlows to get magnifcation and this would be a heck of a lot easier than unmounting the device from the top of the eyepeice and moveing it to another eyepeice. The most logical thing for Televue to have done here is to simply have an adapter that has an interface to the existing Dioptrix connection on the top of their eyepieces on one side, and a thread that does to the front of the ENVIS/PVS-7/PVS-14 objective on the the other (they are all the same thread). this though of course would mean that changing eyepieces would be a multiple step process. For example, say you are using a PVS-14 attached to the top of the Televue eyepeice with the Televue adapter and a 1.25" filter on the barrel of the eyepiece, and you wanted to change to a 10mm eyepiece. You would have to remove the device and the interface from the top of the Televue eyepiece, pull the eyepiece, unscrew the filter, screw it on to the new eyepiece, put the eyepiece back into the scope, and re-attache the adapter and device. With the C mount, the filter is on the 1.25" nose. to change power, you simply pull the device, stick in a Barlow, and stick the device back in. And there are already adatpers out there that can take you from the threading on an eyepiece like the Baader Zoom, to C mount, so if I wanted to do afocal, I would sooo use a zoom because heck, I to lazy to do the rest of it. LOL. And if you have doubts about the pricing, just call Richard. Even if the cost is more than you can build up a PVS-14 with used parts, I think most people here would agree with me that you would be better off just biting the bullet an buying the Mod 3 C housing. It is just far more flexible than the PVS-14 and it does all of the same stuff that the 14 does, and just as well as the 14 does because as we are saying, it uses the same tube and the same optics, and will mount using the same PVS-14 options. And if you can't buy it today, wait a couple of paychecks. No giant extinction level asteroid impacts in the forecast for the next two months! Better to wait and get the right thing and rush now and get the pretty close but not quite right thing. Edited by Eddgie, 30 May 2017 - 03:43 PM. Thanks so much for the wealth of information! Im waiting to hear back from UNV to see what they say. I will update here when I figure out whats going on. Hopefully can change my order. They just emailed me, said it was probably on the truck...told me to reply fast. I said to change it with mod3 c-mount option if it wasnt too late. Never got reply back and just got a tracking number for pvs-14.... oh well, I will see what this televue adapter is about when it is released. If the bug bites...Ill build a Mod3 next. That mil-spec complete pvs housing kit was too good of a deal to pass up really, Already was on discount from $850 to $675, then down to $650 with discount code. I could probably throw a cheap blem tube in there and sell the whole unit on ebay and make a few bucks if I had to. Edited by deezdrama, 30 May 2017 - 05:03 PM. Congrats on joining the NV club, deezdrama! Looking forward to your "first light" report! I hope that people have seen throughout my posts that I generally try to take a positive tone and encourage ALL use of night vision in astronomy. The more eyeballs looking through NV gear and the more minds being blown, the better. That being said, I find this bit of shade about "the rumour mill" to be unfortunate, and I can't help but take some umbrage since my voice is probably part of the peanut gallery comprising said mill. I have used my Mod3 in afocal configuration, albeit hand-held, and I definitely can appreciate that value of that. However, with use of barlows and focal reducers, I can reach most desired focal lengths and have a much lighter optical train, AND not be wed to any particular eyepiece vendor. Furthermore, the ability to use a variety of C-mount gear in my Mod3 has been fabulous. Here at EAA (Macy's), we just might send you to Gimbel's to get the right parts. Edited by Vondragonnoggin, 30 May 2017 - 07:43 PM. I find this to be a disservice to those who actually use NV devices here. I have never seen anyone state that afocal is bad, but this is leaving out that prime focus is the more widely used application with least issues and does not require any TV eyepieces with dioptrx ability. Oh, it's worse than that. I read that Tele Vue blog post again. And it is factually true. However, in discussing the afocal approach with long focal length eyepieces in fast Newtonians, it implies (intentionally or not) that the 26mm prime focus NV device will see the shadow of the secondary mirror if used with a faster Newtonian. As we all know that is plainly WRONG. Yeah, Every time I ask a question over there I feel like the sponsor jumps in to discourage me and then "offer the answer"...which usually means buying something from them, instead of just helping answer the question I asked. I get it...I do, but Im putting my own pvs-14 together. No big deal, I got the housing kit on the way, then I will buy a surplus blem that is omni v or better mil-spec so I will know I am getting at least military contract specifications on the tube, then I will purge the air out with argon. Simple, and will be in it about $1300-$1500.....because thats what I can afford right now. They pretty much discouraged me from piecing my own kit together, and said mistakes will be made and people usually dont save any money building there own. I know this is not true, will I have an autogated, filmless white phosphor, omni viii tube with warranty.... no. But I could never have that because I cant justify spending that all at once right now. But ill have a more than capable monocular that will probably be 90% on par albeit no warranty....but at less than half the price. After all the scopes ive built/modded/worked on in the past....It will be nothing to drop a tube in and purge the system. I know they are the other sites sponsor and have free advertizing reign ...but its a little heavy. Glad to find old/new friends back on cloudynights who are well versed in this tech. Ill stick to this forum for the most part. Thanks guys! Oh.... and all I have right now is an Orion 80st achro.... Is it even worth upgrading focuser and looking into fashioning/buying a pvs-14 afocal adapter on this little scope? Edited by deezdrama, 30 May 2017 - 09:40 PM. Yes on worth it to upgrade the focuser. The ST scopes do really well with narrowband Ha and even Longpass filtering. Ha narrowband eliminates any CA and longpass filtering removes all but some slight secondary spectrum CA in 610nm and 640nm. 685nm longpass begins to look as tight on stars as the narrowband Ha. The kicker is if you upgrade the focuser with a short drawtube and buy the scopestuff flat adapter to fit the focuser in, you eliminate the lightpath cutoff the stock long drawtubes have and will gain some spacing needed to use a .5x reducer on the scope for an ultra fast DSO buster that yields bright nebulae albeit on a smaller scale. Brilliant for framing North American Nebula or California, or take in all of Heart and Soul nebula, M8 and M20 in one view, M16 and M17 in one view. I know they have the adapter at Scopestuff to fit a 120ST (several of us have 120ST's), but have to check if they have it for the 80ST. You can wait though and get 1.25" nosepiece and filters which will be less expensive than going 2" and use the stock focuser until you are ready to upgrade stuff. It will probably stay in your scope stable and get used a lot. I would use an 80ST, but already had bought an AT72ED I use frequently with two inch filters and nosepieces and 2" .5x reducer. The 80ST with the right focuser and 2" accessories would get to use the bigger 2" .5x reducer which doesn't vignette used on c-mount housings. All my 1.25" reducer experiments showed vignetting. With 40° FOV, you want to try and avoid vignetting, but sometimes that bright factor might be worth tye 1.25" experiment, even with vignetting. The 80ST definitely would have been on the list if not for already having the AT72ED. When I started with NV, I researched quite a bit before making purchases and bought my 120ST specifically to use for NV work in narrowband. It's my most used scope now. I have a bigger 152mm F/5.9 I also really like but a little heavy at 23lbs for OTA and plan on getting a 150mm F/5 and upgrade the focuser. OTA is only 16lbs on the Omni XLT F/5 refractor and would make a fine 6" with reducer for a light bucket. So yes, plan on using the 80. Worry about upgrades on it later if you really start enjoying NV astronomy. Even F/5 views are bright and will pick up a ton of nebulae.